Chepstow Harrier Katherine Matthew smashed the female course record at the Devauden 10K challenge on May 5th. Her time of 39.54 was one minute and 36 seconds faster that her record breaking time last year. Her run, which earned her a £100 bonus was an exceptional effort as she was third home overall and one of only four runners under 40 minutes on this challenging off-road course around Chepstow Park Woods. The race winner Matt Collins won in 36 minutes and 18 seconds, which was more than two and a half minutes ahead of Mark Jennings, who won the race last year, missing out on Mark’s course record by 13 seconds. 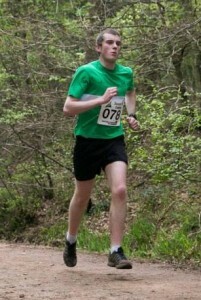 Forest of Dean AC’s Marcus Bennetto was 12th in 46:06. Peter Short finished in 53:29 and Graham Bennetto in 58:48.